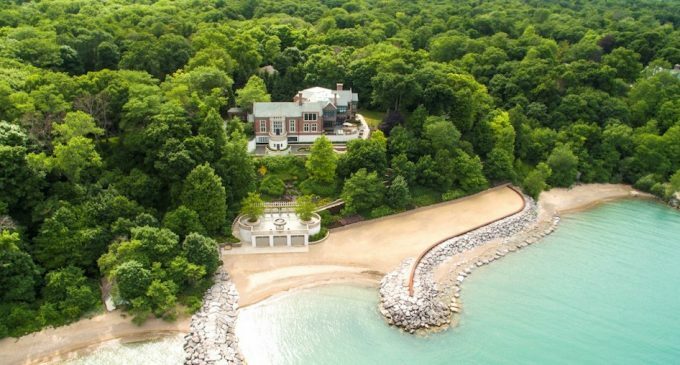 An incomparable residence designed around a historic c.1928 great room on Lake Michigan has just hit the market for $12,000,000. The one-of-a-kind residence sits on a 2.7 acre property overlooking the lake and exemplifies what can be built today with detail & craftsmanship borrowed from the past. The soaring great room was designed by Alfred Granger in 1928 and architect Stuart Cohen designed a new six bedroom home around the space in 2001, incorporating equally impressive formal rooms and detail. After eight years of design & construction, the carved limestone, brick & timber home was completed in 2001. Much of the woodwork and lighting was designed and fabricated in England, while the landscaped bluff, an engineering feat taking 5 years to complete, was developed with stone paths, steps & terraces leading to a 2, 500 square foot heated boat house with approximately 400 feet of protected beach. The house spans 8,865 square feet with six bedrooms, six full and two half bathrooms, a DeGiulio kitchen and panelled library all with gorgeous lake views! The truly unique property is on the market for $12,000,000 with Ann Lyon of Berkshire Hathaway.